WILL OGDON was born in Redlands, California in April 1921. He and his family left Southern California three years later, living first in Illinois and then in Wisconsin. He received his B.A. in music from the University of Wisconsin in 1942. After three and a half years of service in the Army during the second World War, Ogdon began graduate studies at the University of Wisconsin and then at Hamline University in St. Paul, Minnesota where he studied composition and related subjects with Ernst Krenek, receiving his M.A. degree in 1947. Doctoral studies in musicology with Manfred Bukofzer and composition with Roger Sessions followed a three year teaching tenure at the University of Texas. Unhappy with Bukofzer's insistence that he concentrate solely on musicology, Ogdon transferred to Indiana University. A Fulbright grant to Paris, where Ogdon studied composition with René Leibowitz, interrupted his Indiana studies but he completed a Ph.D. in music theory with minors in composition and art history in 1953. Ogdon spent nine years at Wesleyan University, teaching composition and diverse other subjects, interrupted by a two year stint as music director of the Pacifica Foundation's radio station, KPFA. 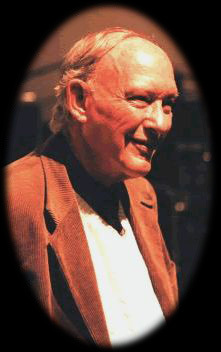 After a year as Media Director of Music Programming at the University of Illinois, Ogdon became the founding Chair of the new music department at the University of California, San Diego in 1966 and retired in 1991. Since retirement, Ogdon has concentrated on composing. To be asked to write about Will Ogdon and his music is a particular pleasure because our musical lives have intertwined in various ways. We both met at Hamline University in St. Paul in 1946 and we retired from the University of California, San Diego (UCSD) in 1991; a time frame of fifty-five years. We came to Hamline to study with Ernst Krenek, the well-known Austrian composer who was teaching there. (By chance, even our desks in the back of the college library were back to back.) Will returned to the Twin Cities in 1954 to teach at the College of St. Catherine and lived in the same four-plex we rented from Hamline. We rejoined each other in 1967 with the formation of the UCSD Music Department, which could be considered one of Will‚s finest imaginative works. His "Music One" course illustrates one of the distinctive approaches in the department he formed. Devised by Will and Robert Erickson, it was team-taught, lasted an entire academic year, and was intended for undergraduates who were not in music. One of several projects, for example, was to make a sound map of some section of the campus, tape record those selected sounds, and then compose a tape work of two or three minutes using twenty or more splices. Projects such as this,combined with a wide variety of listening and attendance at concerts served as our "introduction to music." Will has written an extensive range of music over the years: a theater work for chamber ensemble and two singers, several orchestral works, and some exceedingly striking and expressive choral works that should be rediscovered and performed more often. His music is distinctive and he follows his own path and is not swayed by changing trends. (Now that he is retired, he calls himself a "full-time composer.") Many of his works are for voice and even his instrumental chamber music seems to me, in some sense, to be songs-without-words. His music is often brief, but not merely laconic; his music has the very expressive qualities that can remind one of Imagist poetry. The works on this CD are fine examples of the full-time composer Will Ogdon. Will Ogdon sits atop conquered territory. His view from that perch, though isolated and pensive, is a gorgeous sight, lovely and nostalgic. His is music the Viennese serialists might have written had they been more comfortable and relaxed about the system they developed. For them, the warriors long past, the twelve-tone technique was a revolutionary crowbar that leveraged composers into a new relationship with the world; and though they longed for comfort, they rarely attained it. For Ogdon it is a place for unhurried reflection. There is nothing to be proved ˜ just a need to be honest and true to one‚s character and inner values. Here is a music that communicates life's uncertainties and unfulfilled longings with resolve and a quiet dignity that comes from seasoned introspection. What is revealed within this music‚s dodecaphonic context is surprisingly tonal. It is wistfully expressive and simply beautiful in its subdued romanticism ˆ listen to the brief but pregnant piece for solo marimba, Oratory, which swells suspended over long fermatas, followed by falling minor thirds; or the doubling of lyrical lines in the Third String Quartet and the Second Wind Serenade, often in thirds and sixths. Both life‚s smallest details and greatest contradictions fully engage Ogdon‚s attention. The nervous tremolos which resolve phrases in the Violin Suite capture the contradictions between longing and acceptance. These tremolos are the most agitated feature of the work and also the most conclusive in their strategic cadential function. The heavy issues of D. H. Lawrence‚s poems in the Moon Songs suit Ogdon and are underplayed with small gestures. The grand drama of life and death is played out in the second of Two Songs for Two Seasons which describes, in both the composer‚s own text and music, the anxieties of a stalked rabbit in a bleak winter scene. His style minimizes external conflicts so that it is never overtly dramatic or melodramatic. Yet it emphasizes the private details of something ordinary turned over and over, lovingly, in his hands. Consider how in the first movement of his Third String Quartet the interweaving cavatinas (a "cavatina" is a simple song), scherzos, a trio and a nocturne act essentially as variations on a theme, as if the observer were reflecting on the same object from different angles. We see this rigorous process again in the 3 by 3 small trios of the Introduction and Nine Short Variants. With similar careful familiarity and love of contradiction, Ogdon reaches out to friends and colleagues with small pieces in which a sense of isolation looms large. Each of the movements in his Three Piano Pieces is dedicated to, respectively, Stefani Wallens, Aleck Karis and Cecil Lytle -- pianists, and friends, all. The multi-sectional Violin Suite is likewise dedicated to his dear friend János Négyesy. Will Ogdon‚s view is at once vast, covering friends, objects, and life itself, while never losing its introspective focus. "Igor Korneitchouk and Ray Cole"